Dynamism, perfection, precision. It is on these shared values that HUGO BOSS has built sponsorships with sport’s leading talents in the fields of golf, motorsports, sailing and soccer. 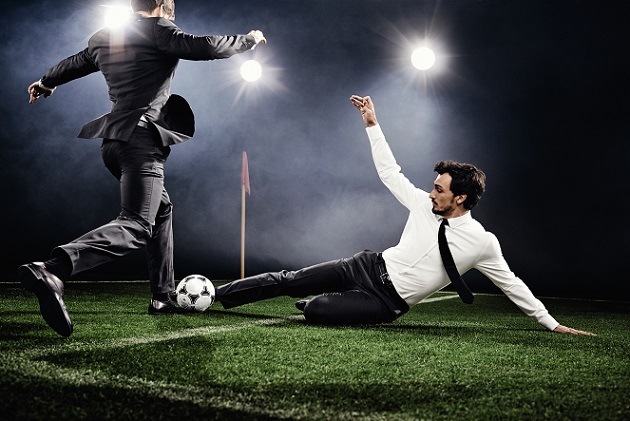 HUGO BOSS’s sponsorship of soccer encompasses some of the world’s most prestigious and successful clubs and Germany‘s national soccer team. 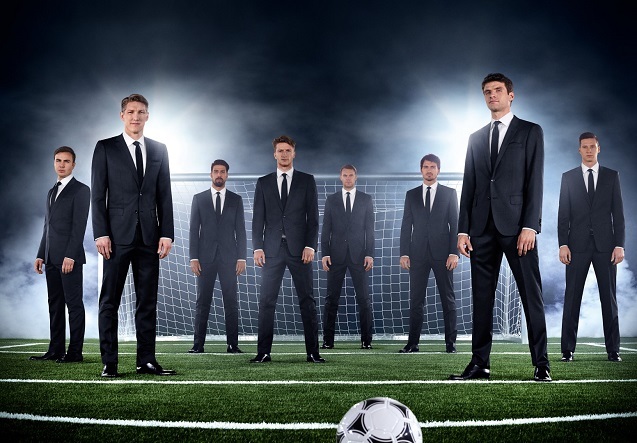 Since June 2013, HUGO BOSS has been the official fashion outfitter of Germany‘s national soccer team and its under-21 squad. Alongside a sharp business ensemble for official events, a laid-back travel outfit provides a casual and comfortable look, perfect for when the team is on the go. National coach Joachim Löw and the coaching staff are wearing custom-tailored suits from BOSS MADE TO MEASURE. The most successful team in Europe, Real Madrid is outfitted in elegant BOSS looks for their global schedule. The world-renowned club wears BOSS during the course of 2016/2017, which is set to be an exciting season, as the players defend their title as Champions League winners. Based on an agreement sealed in July 2016, the partnership also covers the squad of the club‘s second team Real Madrid Castilla and its basketball team Real Madrid Baloncesto. As Paris Saint-Germain’s official fashion outfitter, HUGO BOSS continues to suit the current Ligue 1 champions and define the team’s modern, elegant look for the 2016/17 and 2017/18 seasons. The successful partnership between Paris Saint-Germain and the Metzingen-based fashion brand was launched in 2014. As part of this agreement, the players, their coach and assistants will wear BOSS suits during their official appearances for home matches in Ligue 1 and the UEFA Champions League. 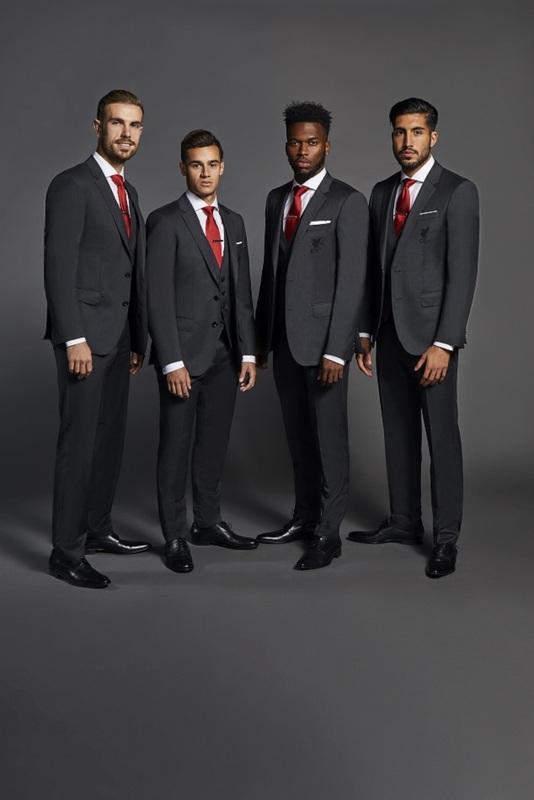 The successful partnership between Liverpool and HUGO BOSS was launched in 2015 and has been renewed for 2016/17. The hugely popular Liverpool Football Club wears sharp BOSS looks at all official engagements for the season. With an exciting time ahead, the team play for the second year under the watchful eye of much-loved coach Jürgen Klopp, who is training them to peak performance for the matches to come. As Galatasaray’s official outfitter, HUGO BOSS continues to suit its squad and players with refined looks for the 2016/17 season. The successful partnership between Galatasaray and the fashion brand was first established in 2015. As part of this agreement, Galatasaray’s players, their coach and assistants will wear slim-cut BOSS suits from the „Create Your Look“ collection at all official appearances and when traveling. HUGO BOSS is lined up as exclusive fashion outfitter for top Swiss team FC Basel 1893. For the 2016/17 season, the fashion brand dresses the renowned team, who remain unbeaten for the 8th consecutive year in the Swiss Super League. The partnership between the long-established club and the company was formed in 2014 and guarantees the team and trainer Urs Fischer step out in style off the pitch.